The clavicle or collarbone is a long bone that serves as a strut between the shoulder blade and the sternum or breastbone. There are two clavicles, one on the left and one on the right. The clavicle is the only long bone in the body that lies horizontally. Together with the shoulder blade it makes up the shoulder girdle. It is a touchable bone and in people who have less fat in this region, the location of the bone is clearly visible, as it creates a bulge in the skin. It receives its name from the Latin: clavicula ("little key") because the bone rotates along its axis like a key when the shoulder is abducted. The clavicle is the most commonly fractured bone. It can easily be fractured due to impacts to the shoulder from the force of falling on outstretched arms or by a direct hit. The collarbone, a large doubly curved long bone that connects the arm to the trunk of the body. Located directly above the first rib it acts as a strut to keep the scapula in place so that the arm can hang freely. Medially, it articulates with the manubrium of the sternum (breastbone) at the sternoclavicular joint. At its lateral end it articulates with the acromion, a process of the scapula (shoulder blade) at the acromioclavicular joint. It has a rounded medial end and a flattened lateral end. From the roughly pyramidal sternal end, each collarbone curves laterally and anteriorly for roughly half its length. It then forms an even larger posterior curve to articulate with the acromion of the scapula. The flat acromial end of the collarbone is broader than the sternal end. The acromial end has a rough inferior surface that bears a ridge, the trapezoid line, and a slight rounded projection, the conoid tubercle (above the coracoid process). These surface features are attachment sites for muscles and ligaments of the shoulder. The anterior surface is convex forward and gives origin to the pectoralis major. The posterior surface is smooth and gives origin to the sternohyoid muscle at its medial end. The superior surface is rough at its medial part and gives origin to the sternocleidomastoid muscle. The inferior surface has an oval impression inferior to its medial end for the costoclavicular ligament and is called costal tuberosity. At the lateral side of the inferior surface, there is a subclavian groove for insertion of the subclavius muscle. At the lateral side of the subclavian groove, the nutrient foramen lies. The medial part is quadrangular in shape where it makes a joint with the manubrium of the sternum at the sternoclavicular joint. The margins of the subclavian groove give attachment to the clavipectoral fascia. the anterior border is concave forward and gives origin to the deltoid muscle. the posterior border is convex and gives attachment to the trapezius muscle. the superior surface is subcutaneous. 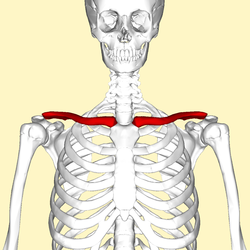 the inferior surface has a ridge called the trapezoid line and a tubercle; the conoid tubercle for attachment with the trapezoid and the conoid ligament, part of the coracoclavicular ligament that serves to connect the collarbone with the coracoid process of the scapula. The collarbone is the first bone to begin the process of ossification (laying down of minerals onto a preformed matrix) during development of the embryo, during the fifth and sixth weeks of gestation. However, it is one of the last bones to finish ossification at about 21–25 years of age. Its lateral end is formed by intramembranous ossification while medially it is formed by endochondral ossification. It consists of a mass of cancellous bone surrounded by a compact bone shell. The cancellous bone forms via two ossification centres, one medial and one lateral, which fuse later on. The compact forms as the layer of fascia covering the bone stimulates the ossification of adjacent tissue. The resulting compact bone is known as a periosteal collar. The shape of the clavicle varies more than most other long bones. It is occasionally pierced by a branch of the supraclavicular nerve. In males the clavicle is generally longer and more massive than in females. A study measuring 748 males and 252 females saw a difference in collarbone length between age groups 18–20 and 21–25 of about 6 and 5 mm (0.24 and 0.20 in) for males and females respectively. The left clavicle is usually longer and not as strong as the right clavicle. In birds, the clavicles and interclavicle have fused to form a single Y-shaped bone, the furcula or "wishbone" which evolved from the clavicles found in coelurosaurian theropods. ^ a b c Moore, Keith L.; Dalley, Arthur F. (1999). Clinically Oriented Anatomy (4th ed.). Lippincott Williams & Wilkins. ISBN 978-0-683-06141-3. ^ a b c Romer, Alfred Sherwood; Parsons, Thomas S. (1977). The Vertebrate Body. Philadelphia, PA: Holt-Saunders International. pp. 184–186. ISBN 978-0-03-910284-5. ^ Larson, Susan G. (2009). "Evolution of the Hominin Shoulder: Early Homo". In Grine, Frederick E.; Fleagle, John G.; Leakey, Richard E (eds.). The First Humans - Origin and Early Evolution of the Genus Homo. Vertebrate Paleobiology and Paleoanthropology. Springer. p. 66. doi:10.1007/978-1-4020-9980-9. ISBN 978-1-4020-9979-3.